If you really want to know how to care for a lawn you need to focus in and learn something about the individual grass plants that comprise it. After all, a lawn is simply an area of land covered by one or more types of grass plants. And there are actually about a million individual grass plants on a 1000 sf area. So lets learn something about these grass plants. Q. Why is it that you can cut off a third or a half or even more of a grass plant, and do it regularly throughout the growing season, and yet the grass survives? If you did that to any of your other plants in the yard or house they probably would die within a season. A. Because grass grows differently from most of your other plants. Other plants, whether shrubs, trees, tomatoes or vines, keep adding on new growth to stems or branches that already have formed. New growth is always occurring at the extremities, far from the base of the plant. Not so with grass. Though some growth occurs on the leaf blades, the key growth point for grass is the crown. 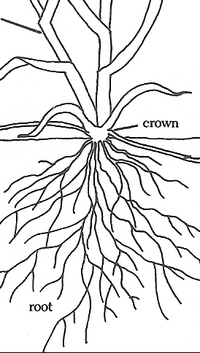 If you look at the illustration you will see that the crown sits at the soil line and it is also where the shoot section and the root section of the grass meet. The crown is a highly active growing point that pushes stems (and the leaf blades that form around them) upward. Aside from the growth that can occur on the grass blades themselves, we find that essentially, the old growth of the grass is at the top of the plant while the new growth is at the bottom. The crown is also responsible for initiating the roots, but the roots then grow in a more typical fashion. New growth cells form at the tips of the roots instead of the crown. The roots elongate in search of water and nutrients and form a very extensive and fibrous network, most of it being invisible to the naked eye. According to a lawn site at Purdue, one researcher, who examined the root system of Kentucky bluegrass, found that in one cubic inch of soil there were 2,000 roots with 1,000,000 root hairs. Poor root growth, for whatever reason, means a grass plant that suffers from poor water and nutrient absorption. Much more about this later. Some grass types can spread rapidly while others will hardly thicken at all. The way your grass spreads actually depends on the particular type of grass you have. Bluegrass is different from ryegrass which is different from bentgrass and so on. And the ability to spread is also influenced by how well you care for the grass as well. There are just four methods lawn grass plants normally use to reproduce or extend out from the mother plant. Most grass species are capable of spreading by two or more of these methods. Dropping seeds is one of the ways all lawn grasses can spread and fill in, but please don't depend on this method. Because we mow the grass before seed heads develop, you rarely see much in the way of seeds on a lawn. If you did not mow your lawn at all, eventually you would see seed heads developing at the top of the stem, extending above the grass blades, like the bluegrass in this image. Some grasses types have adapted to mowing and form seeds closer to the ground, below the mower blade. Every year we get a few panicked calls from our local customers complaining that there is something white growing on their grass. Upon inspection it is only the grass seeding, and doing what nature intends it to do. With all the hybrid grasses today, there is also the possibility that the seed may be sterile too. I wouldn't count on the lawn going to seed as a good method of your grass spreading if it is thin. Most lawn grasses will send out tillers. Some grasses use this method exclusively for spreading out or thickening. These grasses are called bunchgrasses or clumpgrasses. The only way this would fill in the bare area would be to get thicker and thicker over time, and that might take a while. 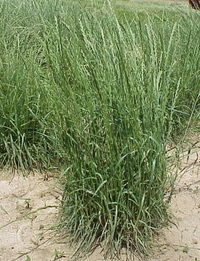 Tall Fescue is also a bunchgrass, and most varieties of this are very wide bladed. When you get a spot of this in an otherwise fine bladed lawn, it sticks out like a sore thumb. Rhizomes are underground runners (or stems) that pop out of the ground a distance from the mother plant, forming completely new plants capable of sending out its own rhizomes. You can see a rhisome in the blue picture above on the left. Rhizomes are a great way for grass to spread, and typically grasses with rhizomes also thicken by tillering as well. Kentucky bluegrass and fine fescue spread by rhizomes. The rhizomes can spread quite far to find an open spot in the lawn. They will also pop up in your garden beds, like it or not, if bluegrass borders the beds. Good soils make it easy for rhizomes to grow, while dense clay soils can make it very difficult. Stolons are somewhat the opposite of rhizomes in that they are above ground runners that travel on top of the soil. They travel a long or short distance from the mother plant and then form independent grass plants as they go along. You see a stolon on the right side of the blue image up above. Creeping bentgrass, St. Augustine and zoysia grass spread by stolons and they will spread rapidly on top of the soil, especially if the soil is easy to root in and not hard or claylike. They can weave their way through other grass types in a lawn and eventually take over the lawn. The commonly held, but incorrect belief is that grass plants get their food from the soil, and if the soil is fertilized the grass has more food. The fact is, when you buy plant food (fertilizer) for your lawn, you're technically not really buying “food”at all. What you are buying is some of the raw materials that can be used to make food for the grass. 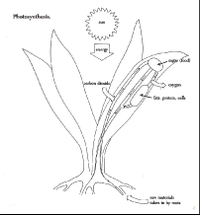 A grass plant manufactures its own food in its leaf blades. Do you remember learning about photosynthesis in grade school? Well, now is when we are going to finally put that knowledge into practical, lawn improving use. All green plants use sunlight to make their own food in their leaves. Photo means “light”; synthesis means “putting together”. Here is the simple version of how it works. The sun's energy helps the leaves turn carbon dioxide (from the air) and water (inside the leaf) into sugars (food). The plant can then use this food to create proteins, fats, cellulose and all the other necessary building blocks – everything it needs to make leaves, stems, crowns, roots, seeds, runners, tillers and so on. Unused sugars are stored as starch in the roots and leaf blades.. So what does the plant get from the soil? It gets water, and dissolved minerals (nitrogen, magnesium, phosphorus, calcium, potassium etc...) and trace elements. These are considered the raw materials that plants need to convert, using the energy from the sugars, into the other building mentioned above. Fertilizers and organic matter supply raw materials, but by themselves are not food. In the leaf blades of the grass, sunlight is used to convert carbon dioxide and water into sugar (food).. The sugars are then turned into proteins, fats,cellulose and all the other building blocks needed for plant health. Most of these building blocks are formed by combining the sugar with other minerals or raw materials in the leaf blades. The roots of the grass take up the water and dissolved minerals and send them up to the leaf. EVERY TIME YOU MOW YOUR LAWN YOU ARE CUTTING OFF SOME OF THE FOOD FACTORY OF THE GRASS. You need to know how to mow the lawn in a way that will optimize the food production in the grass, while keeping the lawn looking good. If you regularly mow the wrong way, you can severely affect the normal food production process. The result will be, at the very least, an unhealthy, stunted, and off-color lawn. It could get worse. The next section is All About Mowing. I plan to give you everything you need to know to experience the Zen of cutting the grass correctly. Stuart Franklin is President of Nature’s Lawn & Garden, Inc. (http://www.natureslawn.com) a lawn fertilizing company and on line Web Store , located in the Buffalo, NY area. He is also the author of Building A Healthy Lawn: A Safe and Natural Approach (Storey Publications 1988). The book is out of print, but we do have some copies at our office.